Bodleian MS. Lat. liturg. f. 4, fol. 141v, woodcut of a maiden, pasted into the margin of the manuscript. On November 15, 2010, Professor Henrike Lähnemann (University of Newcastle) spoke about manuscripts originating in the Cistercian convent of Medingen, in Lower Saxony, during the last part of the 15th century and first decades of the 16th century. The class saw two prayer books, one from the Bodleian Library and one from Keble College, Oxford, and another Bodleian manuscript, MS. Lat. liturg. e. 18, a Liber Ordinarius. These three manuscripts originated in the convent’s use of manuscript creation as a devotional exercise, during a period after the internal reform of the convent in 1478 and before the Lutheran reformation of neighboring Lüneburg in 1526. All three display the distinctive content and style on which Prof. Lähnemann remarked. They contain both Latin and Low German text, and decorations and marginal illustrations. 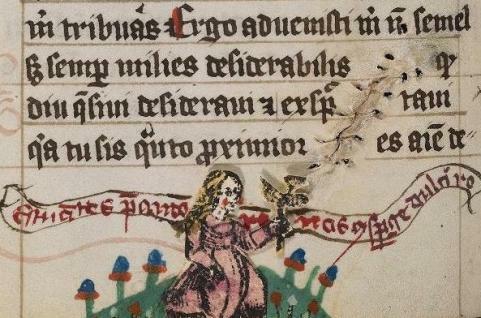 The character of the marginal illustrations can be seen in this image from Bodleian MS. Lat. liturg. f. 4. Most are hand-painted figures, but this figure, unusually, is a woodcut image pasted into the margin of the manuscript. She has been given yellow hair and a pink gown, and a hand-painted lawn with flowers to surround her, by the manuscript creator. See this item in the Bodleian Library’s Luna image database.